Vigor Events – in co-operation with Al Gas Events – organized the first 1-day seminar in the Knowledge Club™ Season 2 titled The Productive Leader on the 18th of November 2018 in Burgan Meeting Room in Hilton Resort Kuwait. Conducted by renowned Author of “The Productive Leader”. 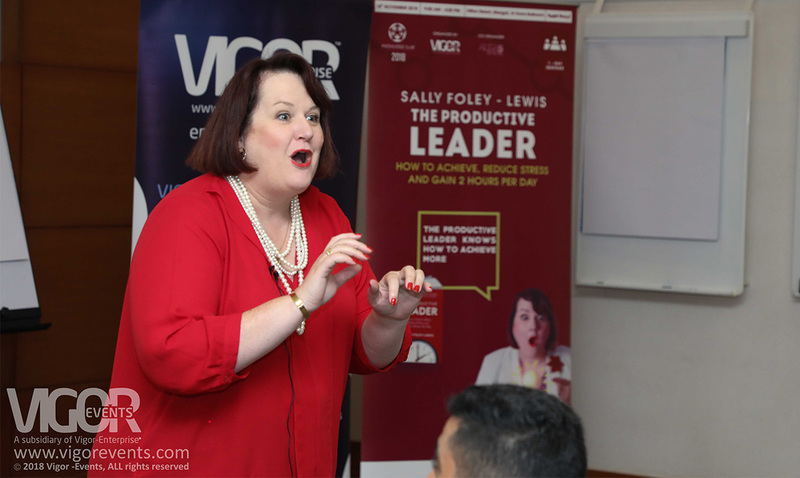 The highly engaging Seminar which was presented by the international leadership expert Sally Foley-Lewis- was designed with the objective for empowering business owners, leaders and managers to be conscious of their thinking and actions to be strong, authentic and confident in their roles. The seminar is part of the Knowledge Club™ 2018 is the leading & development platform for top organizations in Kuwait, is attended this year by Warba Bank/ Burgan Bank as Gold Member, Commercial Bank of Kuwait/ Kuwait Oil Company/ Hadi Clinic as Corporate Members and with the media support by the International Advertising Association (IIA) – Kuwait Chapter.